I had a late start to that Saturday – the requisite “sleep-in” with a leisurely coffee and breakfast followed by catching up on some foodie TV. Note: that’s not FoodTV, but ‘foodie TV’. My viewing of choice is usually a combination of America’s Test Kitchen, Nigella and the latest photogenic “It”-chef making his/her rounds. Eventually I scrubbed up and made my way to the grocery store to do my weekend shopping. This weekend, was a special occasion, I would be making my way to the nearest T&T Supermarket! Woo-hoo! T&T, if you’re not familiar with this chain, is an Asian supermarket specializing in selling Asian groceries and produce, with a full-service Asian deli, fish market, butcher counter, bakery, etc. In short – my preferred destination on a Saturday afternoon! However, it is also the preferred destination of most people living in the vicinity. Yes, I can go at night on a weekday after work, but I like being able to spend a little time wandering the bustling aisles, picking one particular bottle of soy sauce (out of the dozens of brands offered) and waiting anxiously for my number to be called at the butcher counter. Tip: If you’re even remotely interested in getting a hunk of meat – go straight to the butcher first. Grab your number and THEN peruse the goods to pick out what you like. Better to stake your place in line than wait! Trawl the adjacent aisles during the wait to pick up any other groceries while waiting for “your moment”. And it truly is “your moment” – the other shoppers eye you jealously while you walk up and down the case pointing and selecting the choice cuts of meat and receiving the undivided attention of the butcher. Ahhhh….it’s a great time while it lasts. Anyway! 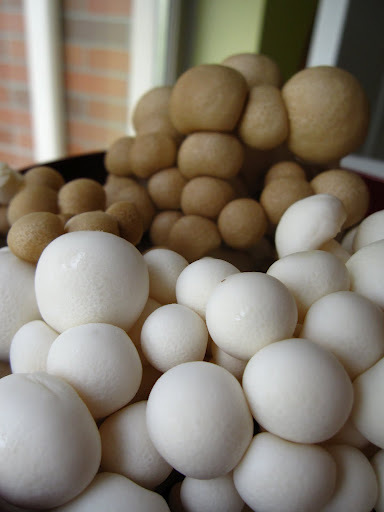 As I scoured the produce section with my list, some small bundles caught my eye – shimeji mushrooms! These earthy beauties are offered in two colours or types – buna (brown) or bunapi (white). These are also called Beech or Clamshell mushrooms. I promptly picked up a package of each. I returned home, itching to open and use my purchases. The meat was put in the fridge, the pantry bottles put away, produce out on the counter baskets, and then – the shimeji…the best for last. I opened up the plastic packaging and a plume of scent hit my olfactory senses. The smell was unlike anything I had ever experienced – it was musky, earthy, and almost…wine-y. I couldn’t wait to put them to use! I was inspired by a recipe on the momofuku-for-2 website – my foodie counterpart had made a dish with butter and miso. 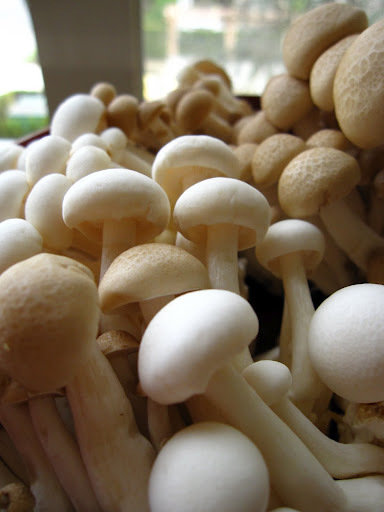 What a terrific combination with mushrooms! 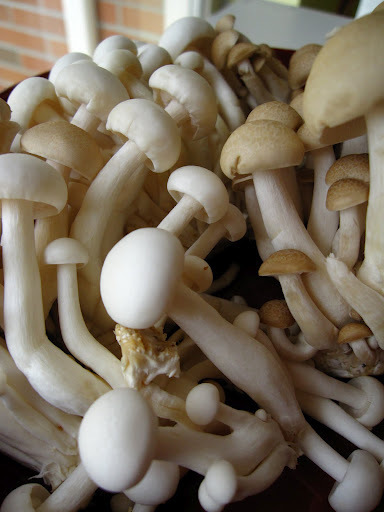 Gently clean the mushrooms – dust off any dirt and cut off the base root to roughly separate the mushroom stems. In a small skillet, melt the butter over medium high heat. When the butter starts to bubble, add the garlic, cook until softened. Add the miso first and then the water or broth. Gently dissolve or mix the miso into the liquid, careful not to disturb the mushrooms too much. Let the miso broth bubble for a few minutes. 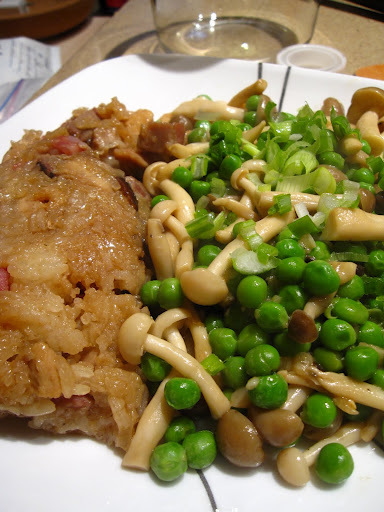 Add the peas – cook until tender. Add the soy sauce and stir gently. Dab a few drops of sesame oil and mix. Remove skillet from heat and plate – top with scallions.